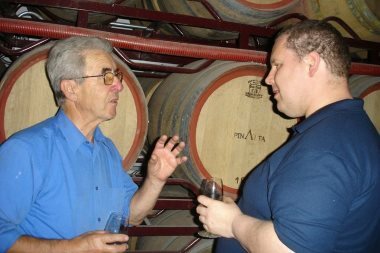 Last year I reviewed the first wine made by Andrew Norrie, and excellent Douro red from the 2014 vintage that was his first solo effort as winemaker, having been associated with the nearby Pinalta estate for several years (picture shows Andrew, right, with Pinalta’s owner António Alves Ferreira). Andrew who hails originally from Edinburgh but now lives in the Douro, recently sent me samples of his latest releases, a 2015 red and 2016 rosé, as well as an intriguing Port he has just bottled on behalf of an elderly Douro resident from a single ‘pipe’ or barrel that has remained untouched for 80 years. Tracking down the required paperwork to be able to label and sell the 1935 Port was a major headache, and though Andrew is not yet allowed to declare the details, his detective work has identified the Port shipper who produced it, and the Quinta where it was made. Having just completed bottling of the Port, 154 bottles in total, Andrew sent a precious sample over for me to taste too. Anyone looking to purchase the Port or indeed any of Andrew’s wines should link up with him on Facebook at https://www.facebook.com/andrew.norrie.3. (2017) Made from 40-year-old vines of Touriga Nacional grown in the Tua valley. The wine is foot-trodden in lagar, before maturing for three months in new French oak. Vivid, bold, deep crimson in colour, there's a beautiful fragrance here, the floral top notes of violet and briary roses over firm black fruit and a touch of cedar. The palate has lots of spice, from the grapes rather than the barrels, again that firm and unwavering core of acidity and tannin, wrapped in a smoothing, tobacco and chocolate veneer. Really very good. (2017) A blend of 60% Touriga Franca and 30% Touriga Nacional with 10% Tinta Roriz (Tempranillo), from the Tua Valley. It's a deeply-coloured rosé, more of a light red, with summery berry aromas and flavours to the fore, from pulpy strawberry to a nip of cherry tartness. This recently bottled sample was touch spritzy, but that does add to the refreshment value as it finishes dry with a tug of tannin. (2017) Scot Andrew Norrie came across a pipe of an old Port, being sold to help with funeral expenses for an elderly Douro family, and set about helping out by establishing exactly what was in the barrel before bottling and selling it. Finally he tracked down the necessary paperwork to establish it is a Port registered in 1935 and made at famous Quinta. It's a wine with a dark colour, still some ruby at the core, and it is intensely aromatic: there is obvious age with a bit of oxidation character and brown sugar, but a beguiling mix of cherry and sweet, damp earth too. In the mouth it is generous, and sweetly rich, Agen prunes and Medjool dates, a touch of liquorice and also honey, and a long, intense finish with the curranty sweetness offset by still good acidity and a bit of tensioning alcohol. Really it's treat to taste this, and wonderful that it has been made available.